Playa d'en Bossa, Ibiza. Beautifully styled modern hotel right in the heart of Playa d'en Bossa, next to its long sandy beach, with its own parties and events. Santos Ibiza Suites - Hip, avant-garde style, vintage touches and an homage to rock and roll's finest come together in this hotel from the cool Concept Hotel Group. Located right next to the beach, this luxurious adults-only hotel offers easy living and all you need for the contemporary lifestyle in the heart of Ibiza's most popular resort. Santos Ibiza is a place where everything is provided from comfy sunbeds on the gorgeous pool terrace or supreme chilling on one of the extra-large Dream Beds. A great mixed menu is available from the restaurant or you could just get the skilled bartenders to create you a fabulous cocktail from the superb beach bar. A concierge service will arrange anything like restaurant reservations, birthday surprises, guided excursions and much more - all you need do is ask. The spacious Suites bring fresh modern decor with pastel colours and soft lighting to give a modern, boho feel. The stylish kitchenette with bar is ideal to create your own cocktails to get your night started or to rustle up a bite to eat. If you want to spend a bit less, go for the more compact studios, which don't have cooking facilities but still come with a bar area plus a kettle and a fridge. Expect a full events' line-up in the Santos Coast Club: daily sets from top DJs, pre-parties from club promoters and special guest appearances from famous artists happen around the pool. You can also have your own private after party of all shapes and sizes in one of the Club's special areas. The very popular Dorado Live Shows present well known bands and singers – one of the rare occasions to enjoy some live music on Ibiza. And in the neighbouring Dorado Ibiza Suites, there are regular open-air film showings with Cinerama, all making an audio-visual combination that's hard to beat. The fantastic beach side location on the long sandy beach of Playa d'en Bossa gives you close up and personal sea views. Situated in a quiet side street in the centre of this popular resort, you are just minutes from all the clubbing action with super-clubs like Ushuaïa, Hï Ibiza and Sankeys. All around you'll find an extensive choice of bars and restaurants, as well as some chic beach clubs that line the beach, for daytime chilling and night time parties. And if that is not enough, then Ibiza Town is only a short cab ride away for its equally dazzling nightlife with Pacha and the famous bars in the historic old town. 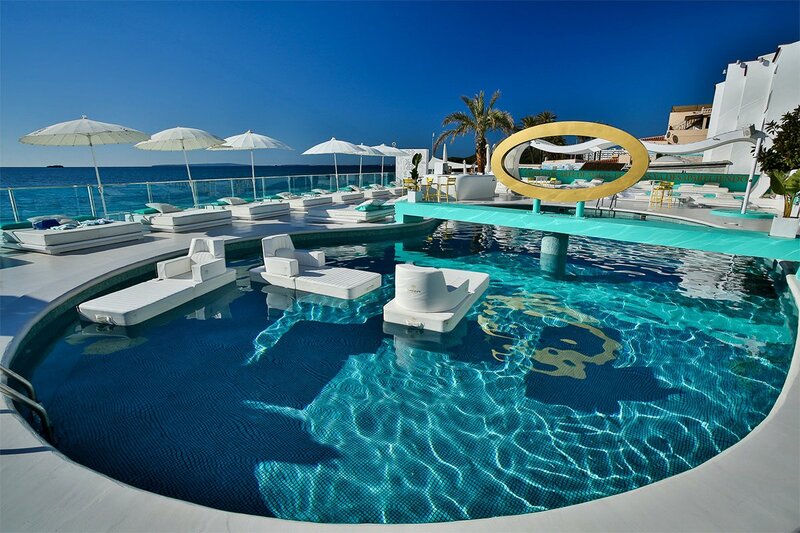 Events & parties in the Santos Ibiza Coast Club. Visit also the other hotels of the Concept Hotel Group in Playa d'e n Bossa, the Tropicana Ibiza Suites and the Dorado Ibiza Suites right next door. And brand new for 2018 we bring you the Paradiso Ibiza Art Hotel in the Bay of San Antonio and the Cubanito Ibiza Suites in the beautiful bay of Cala Gració near San Antonio.